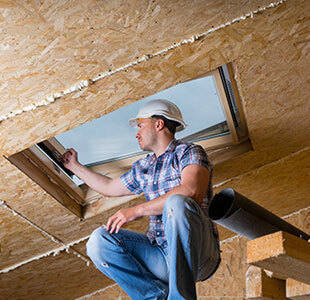 Contractors & DIY Builders - Skylights Manufacturer & Closet Doors | Solar Industries Inc.
Skylights offer an attractive alternative to lighting interior rooms that have, in the past, been dark and unattractive. Now hallways, utility rooms, and interior bathrooms can be made bright and cheerful with Skyview Skylights. Skylights permit the design of all service areas in the core of the house. Plumbing for kitchens, baths, and utility rooms can be effectively and efficiently clustered at an obvious saving in construction costs. To satisfy customer price and location demands, lots are necessarily getting smaller as land development costs skyrocket. Skyview Skylights can help maintain the important sales features of spaciousness and privacy, eliminating the strong disadvantage of windows looking into windows. Skyview Skylights greatly increase house and room orientation options, regardless of lot location. East and North facing rooms can now be light and airy all day. With square foot costs of construction being what they are, many homes are designed as compactly as possible. Skyview Skylights “open up” smaller rooms by distributing natural light uniformly, eliminating the shadows that literally shrink a room. Your models will be seen in all their colorful beauty, none of the interior decorations will be muted or distorted. This abundance of light and color provides a luxurious sense of freedom and escape from confinement. Homes with skylights have a warm and cozy feeling throughout the day, thus increasing sales appeal. The increased wall space provides more decorating options and the bright airy kitchens and baths give strong sales appeal. Builders using Skyview Skylights can capitalize on this. Solar Industries is a wholesale manufacturer of home and industrial skylights. We help consumers reduce their global energy footprint and receive sufficient daylight needs for an environmentally friendly and healthy space to live and work. We offer quality, energy-efficient skylights. Choose from our selection of stock or custom made self-flashing, curb mount fixed skylights in either aluminum or vinyl. We also offer operable, smoke hatch and louvered models. We offer an unmatched combination of service and quality for retailers. Call to see how you can become a local dealer of our fine products.